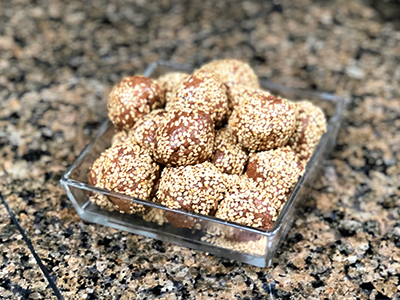 Another healthy snack from the Baobest Kitchen; made with all natural ingredients, including our Baobab Superfruit Powder. 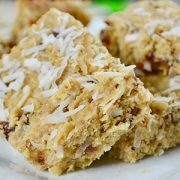 This gluten-free treat is one of our favorites due to the intense moisture which is locked in by the addition of applesauce and of course, the chopped dates which are dramatically complemented by the amazing lemon flavor! Preheat oven to 320 degrees F. Grease and line a 6 inch x 10 inch baking pan. Blend oats in a food processor to form a fine powder. 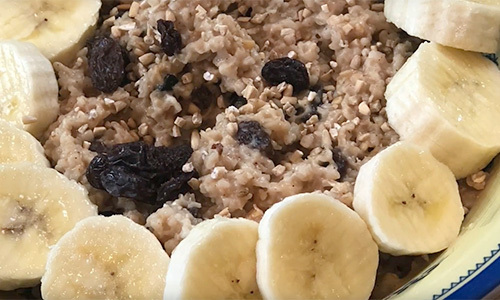 Place blended oats in a bowl and add baking powder, salt, 3/4 of the coconut (reserving some for top of bars), lemon zest, protein powder, baobab powder, and ground flaxseed. Mix. In another bowl, add melted coconut oil, applesauce, egg, and honey or agave then mix. Add chopped dates to wet ingredients and mix together. Combine wet ingredients to dry ingredients and mix well to form loose dough. Transfer to your greased and lined baking pan, level with a spatula and bake for 20-25 minutes. The values may not be 100% accurate because the recipe has not been professionally evaluated nor has it been evaluated by the U.S. FDA. 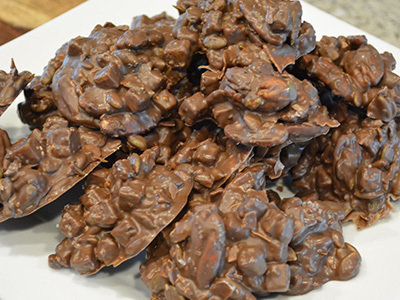 This nutrient dense, chocolate covered Superfood snack is packed with fiber, healthy fats, antioxidants, protein & potassium. What a great, healthy way to satisfy a sweet tooth! 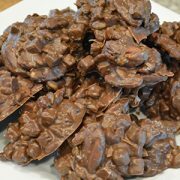 Melt chocolate wafers in crockpot on low for 20 minutes, stir occasionally. Add Blood Orange BaoBites, stir. Use an ice cream scoop to place on parchment covered baking tray. Clean up around edges to make as round as possible. Sprinkle tops with sea salt. Tired of all the processed snacks at the store? 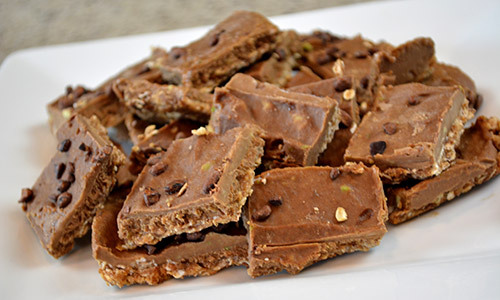 Check out these healthy alternatives to overpriced store-bought treats. The toasted coconut combined with the tangy sweetness of the Blood Orange BaoBites create a hearty, vitamin-packed snack for any time of year! Line baking pan with foil and spray with nonstick spray. 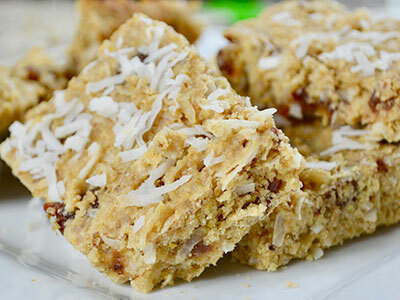 Spread out the oats, coconut, & sunflower kernels on the pan and bake for 10 minutes at 350. 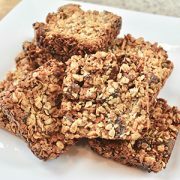 When finished, reduce temperature to 300 and place toasted oat mixture into a large bowl then add the BaoBites and dates. Mix until fruit is coated. In a saucepan over medium-high heat, heat butter, honey, maple syrup, brown sugar, and vanilla until it comes to boil – stirring often. Boil mixture for a full minute and then immediately combine with the oat & fruit mixture, stirring until coated. 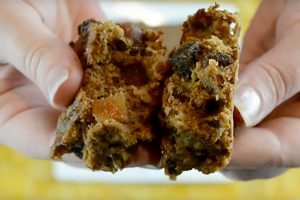 Next, you’ll want to prepare another baking sheet with foil and spray then press the mixture into an even layer or into a prepared bar-baking pan. Bake at 300 for 25 minutes or until light golden brown. 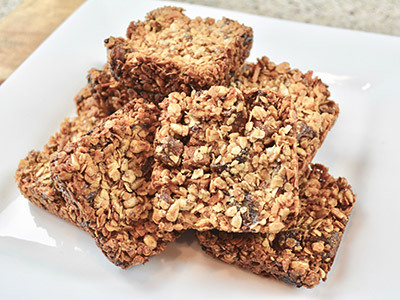 Cool bars completely before cutting or removing from bar-baking pan. As we fully embrace the summer months, the idea of a deliciously natural and incredibly healthy vegan smoothie is certainly topping our list! 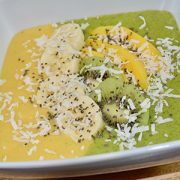 The sweet softness of mango paired with the rich leafy greens of spinach can really pack a nutritious punch. 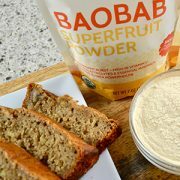 When you add the amazing health benefits of chia seeds and baobab powder, you are looking at a low calorie, all natural, vitamin dense source of fiber & antioxidants. 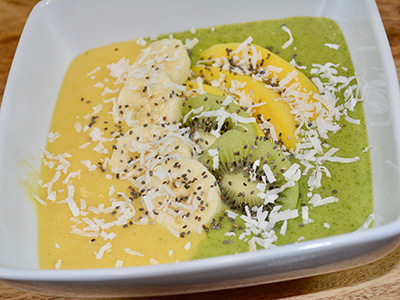 This smoothie bowl takes just minutes to make and is great for starting your day, or simply treating yourself on a lazy summer afternoon. Enjoy! Your new POWER breakfast! 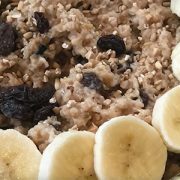 Steel cut oats alone are an excellent source of protein, soluble and insoluble fiber. When you combine these benefits with the Omega 3, 6 & GLA offered through hemp seeds and of course the antioxidant burst and blast of essential minerals from the Baobab fruit – not only will you be fully sated, you’ll start your day as a fitful ball of pure, clean energy! *The values may not be 100% accurate because the recipe has not been professionally evaluated nor has it been evaluated by the U.S. FDA. These delectable vegan treats are a powerhouse of micronutrients designed to boost your body and your mood! 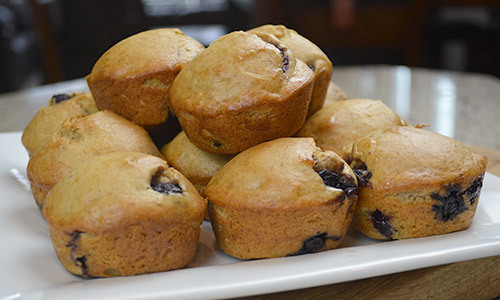 The combination of luscious blueberries, ripe banana with just a hint of nutmeg and vanilla make for a delicious snack any time of day. 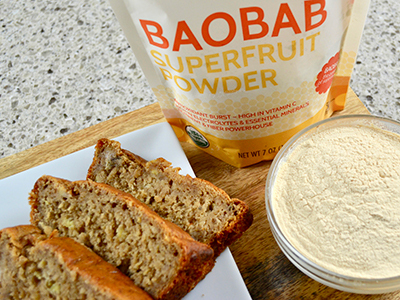 With the baked in addition of Baobest’s Baobab Powder; you’ll also be getting exceptional levels of antioxidants. Make a double batch and freeze for later. Enjoy! 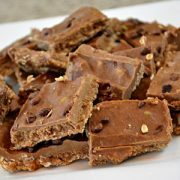 This no-bake, nutrient packed fudge bar recipe is one of our favorites! With 100% raw ingredients, healthy nut butter and a rich chocolatey flavor, you’ll want to eat the whole pan. 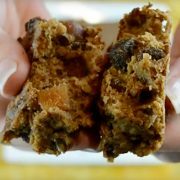 This decadent treat is easy to make, satisfies your cravings, and packs a nutrient punch with the addition of Baobest’s Baobab Powder. It doesn’t get much better than that! 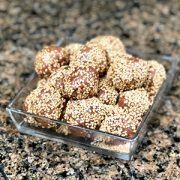 These Baobab Protein Bites are amazing morsels of raw, toffee goodness! Stuffed with energy boosting ingredients like flax seeds, almonds, dates, baobab powder, cinnamon, and cacao; these delicious treats provide your body with extra fiber, healthy fats, and copious amounts of iron and vitamin C. Not only are they ideal before, during, and after workouts but they provide a simple, convenient, nutrient-packed, snack to get you through your day. You’ll want to make a double batch and freeze for later! One of the best (& healthiest) versions of Banana Bread out there! 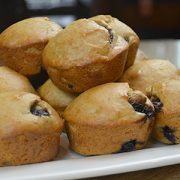 Melt in your mouth moist and packed full of Antioxidants, fiber, vitamin C, potassium, magnesium and calcium! Prepping takes just minutes, slow, long 45-55 minute bake provides incredible, delectable goodness!